Sheffield Independent Media Centre (IMC) — independent grassroots news from Sheffield and beyond! Occupy Sheffield is hosting the 3rd National Occupy Conference over the weekend 20th-22nd January 2012 at the camp outside the Cathedral, and the squatted Citadel of Hope (map). On Saturday at 1pm was a A Rally of the 99%, "a voice for the voiceless – to raise awareness of the issues of people without a voice" in front of Sheffield Town Hall, photos and audio from the rally. On Saturday night there a Occupy Sheffield Benefit Bonanza at the Dove and Rainbow with Roy Bailey at 8pm. Last winter Roy Bailey played a set at the Sheffield University Occupation and you can listen to that here. 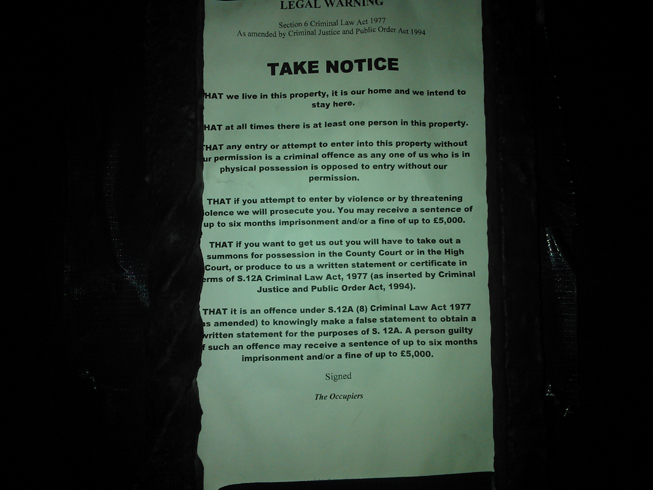 Sheffield Cathedral has served court papers on Occupy Sheffield, there is to be a court hearing on Thursday 26th January and the Cathedral, representing the establishment, is trying to scare Occupy Sheffield and especially the people named in the papers with the threat of costs being awarded against them. The Citadel of Hope has been secured for a month following a court case and agreement with the owner. Following on from the start of Occupy Wall Street on 17th September 2011 there is now a global occupation movement and a growing number of occupations in the UK. For futher radical and alternative events in Sheffield see the Alt-Sheff web site, to get an event listed here please email the Alt-Sheff collective.